Toys Bhoomi Travel Potty is an awesome potty chair that is great for the child on the go. 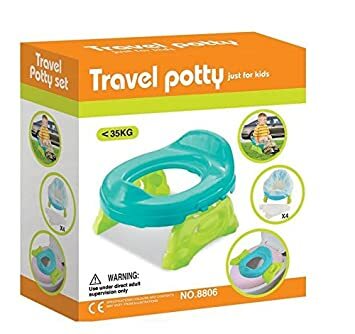 If you are someone who is always on the go with your little one or know someone is, this is a must have, especially if they are potty training. It is also a great idea for the smaller ones who may just need a place to go when on the go. This potty is great because the seat can be used without the potty seat frame. It can be used on regular size toilets. If you don't have access to one or don't want to use one that is available. Just use with the base and one of the bags included. If you are going on a road trip with your potty training toddler, your little one may not be able to hold it until the next rest area. But with our Toys Bhoomi Travel Potty, you will no longer be fighting your toddler to squat alongside the road or run the risk of accidents in the car. Giving your toddler a comfortable seat to use will build his confidence as he masters going potty. The Travel Potty consists of three simple parts. The seat, the base and 4 clear plastic bags. Being simple keeps it easy to take where ever you want to go. Its portability makes it great for camping and long road trips with the family. So when the have to go they have a place to go, even if there is no bathroom around. No more putting off trips due to interfering with potty training and no more regressing by using diapers in the car. It will beat the woods or a dirty bathroom any day and the colorful colors will be welcomed for sure.